I like ideas that involve inexpensive tools and using tools that we already have at the kitchen or around the house to improve life. So, that’s why I decided to build up this “TIPS” section because I think they are worth sharing. The tips involves cracking some nuts. Most of us like to munch on nuts but cracking them open can be a problem sometimes, especially if you don’t have a nut cracker. It is an inexpensive tool, however, the goal here is to use things that I already have around the house and we don’t have a nut cracker. I cook a lot with garlic and few years ago decided to get myself a garlic press. I love this little tool. Lots of recipes I’ve been cooking with called for “finely minced garlic”. I’m not a very patient person myself and to be finely mincing garlic (sometimes lots of them when I make garlic-flavored oil) is just not one of my favorite thing to do I have to admit that. And I don’t like to use garlic powder or the minced garlic in the jar, because they are often packed in preservative that often makes it tastes sour and I hate that. I like to use fresh garlic for cooking. Garlic press helps to solve that problem for me. We also have pistachio nuts stocked in our pantry most of the time. It’s nice to have them as snacks. Ideally, most of them already half-cracked when you purchase them so you can munch them without having to crack them open. But that isn’t always the case, is it ? Sometime you’ll find some that are not and to be using my teeth is simply not an option!! 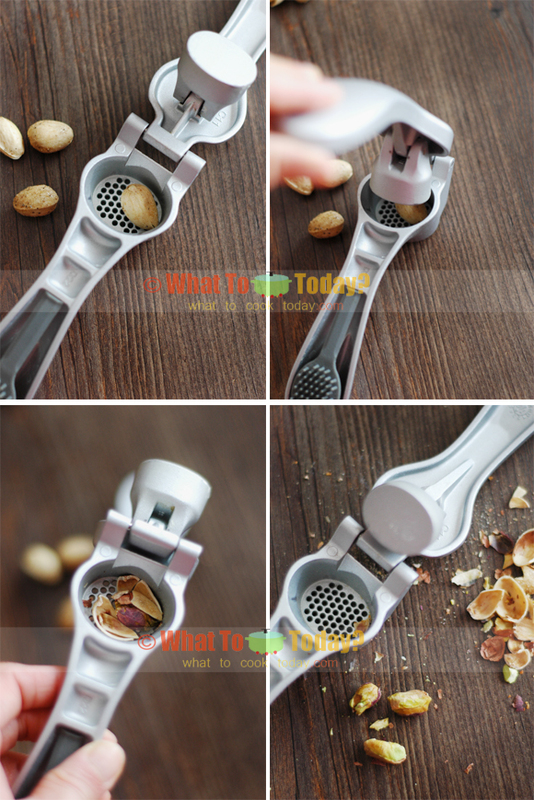 Garlic press can help you crack the pistachio nuts. When you place the nuts on the chamber of the garlic press and gently apply pressure to the nuts until you hear the “crack” sound..and ta..da…there’s your pistachio nuts!! The only problems I found with using garlic press are: The shell break into little pieces and It works only with small nuts like pistachio. 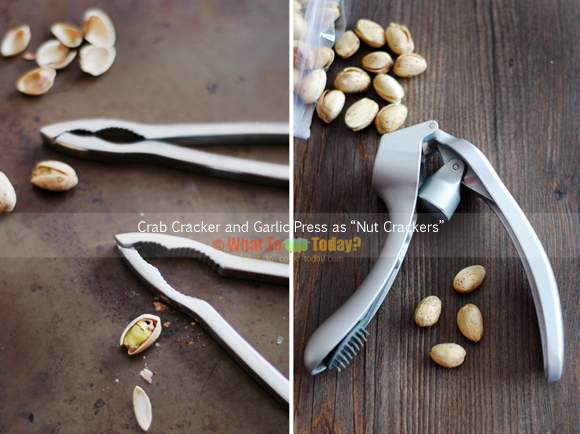 Another alternative to garlic press is the crab crackers. My husband has been using this as a nut cracker for a while. This works well on pistachio and also other nuts. Place the nuts in between the two handle and gently squeeze the handle together and the shell will crack open. 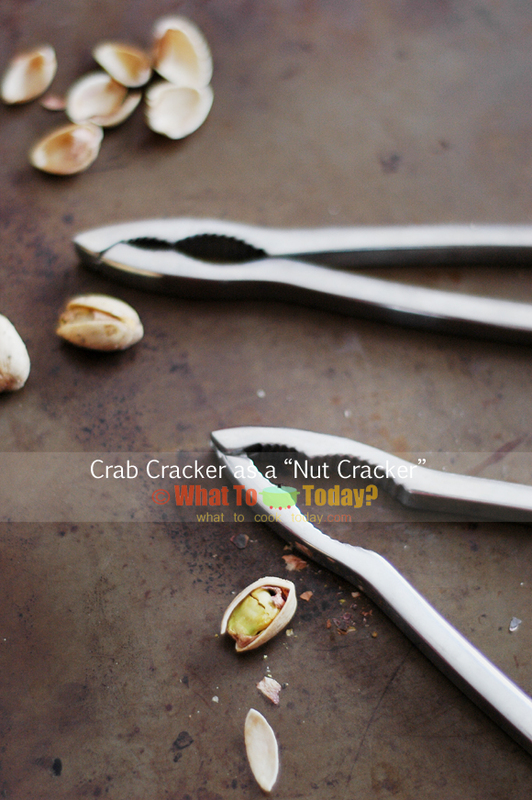 The great things about using a crab cracker as a nut cracker are: It works with not only small nuts, but also large ones and it doesn’t crack the shell into small pieces.